We at SATOL CHEMICALS look at R&D as our key Strength. We have a team of consultants who are specialist for various products and requirements of the Industry. We take care of our customers' requirements by addressing the core needs through our efforts. In-house team makes sure that our products pass key quality tests and necessary trials before commercialization. Research and development is more often than not a crucial factor in the survival of a company. In an industry that is fast changing, we continually revise design and range of products. This is necessary due to continuous technology change by our customer, development and the changing preference of customers. Research and development is an investment in a company's future – It is highly dependent both on the technology area and how fast the market is moving. Significant Percent of our company revenue is spending in research and development, to outgrow our competitors. We follow Market driven Development of our products, Our Sales & Marketing team ensures the judicious information mix from direct customers and our R&D works accordingly. 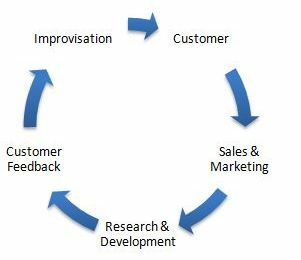 We follow the unique Circles of R&D as our standard process.